We were about a mile into our hike and had come across a team of young hikers breaking camp. 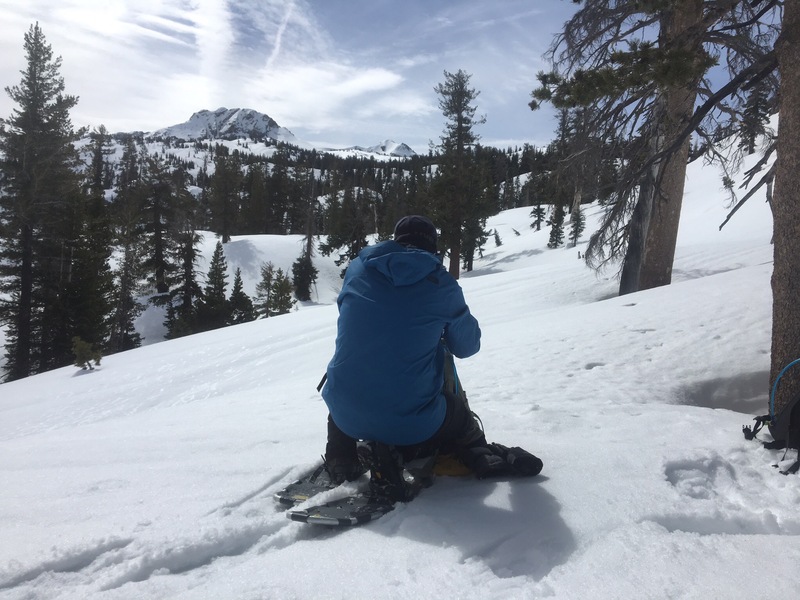 They had spent the night in the Carson Pass Management Area and were planning on making the same trek up Round Top that we were. Our ambition was to climb the peak, theirs to ski down it. Their map and our map were the same: a poor-quality topographical map with two north-south trails clearly indicated. 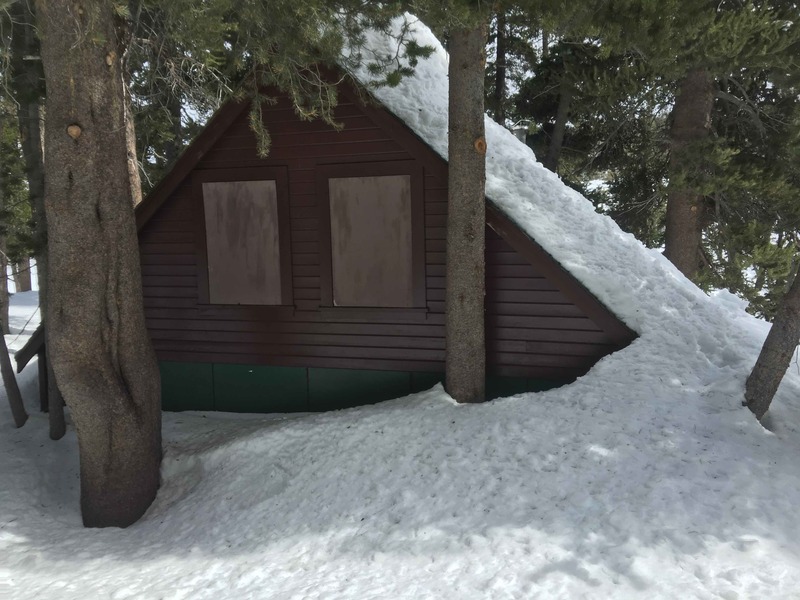 The east-most trail appeared to start at the Carson Pass Sno-Park with a fork heading off toward the east side of Elephant’s Back. They seemed to think that we weren’t heading south on the trail any longer and had accidentally taken the turn toward Elephant’s Back, another 10,000ft peak in the vicinity of our target. The other guys hiked in the night before while it was dark. Brice and I had driven the 3.5 hours from the Bay Area early in the morning, arriving just after 8:00AM where we packed up our gear, hooked on our snowshoes, and started following the cross-country ski trail that had been formed over the last week. We noticed a set of blue diamond trail markers on the trees — clearly an indication that we were on the portion of the Pacific Crest Trail we expected to be on at the start of our journey. Having not seen any obvious forks in the trail up to the other hikers’ impromptu camp, we thought the campers were mistaken and decided to continue trekking on ahead. Another 20 minutes of hiking brought us to an intersection of trails: one coming from due North, one coming from the North East (the one that brought us there) and one leaving the intersection going nearly due East. None of these made any sense given the map we were using which showed no such intersection. To compound the confusion, we could see the tops of yellow road signs and a speed limit marker. We were clearly near a road, but our terrible map showed no roads beyond highway 88 which brought us to the pass. The tall pines surrounding us the entire hike made it impossible to discern large landmarks like mountain peaks with everything obscured by tree trunks and branches. Believing we were at the intersection that would take us to the East of Elephant’s Back and away from our target, we decided to head off trail and start snowshoeing due south. Winter travel can make going off trail very appealing. Snow covers any obstacles that might block your path like large bushes or boulders allowing you to travel in basically straight lines toward an objective. 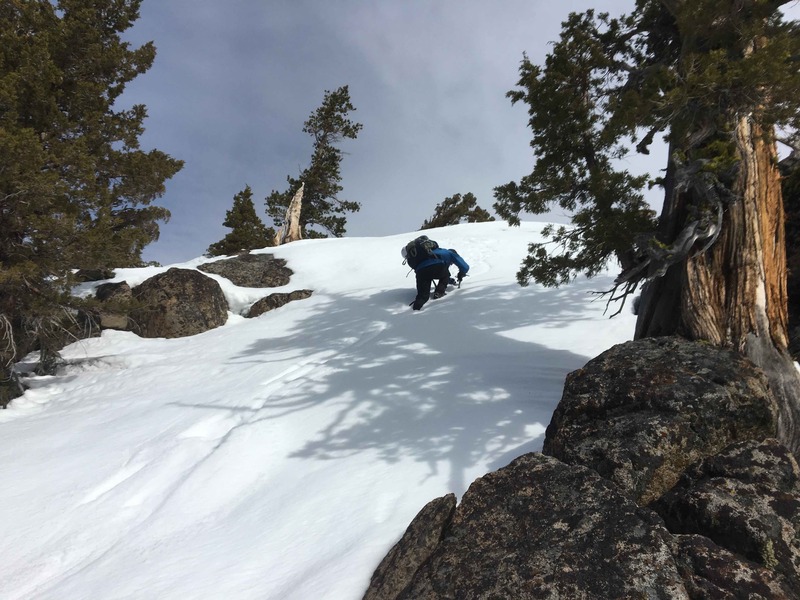 The only limiting factors are the steepness of the terrain and the quality of the snow. 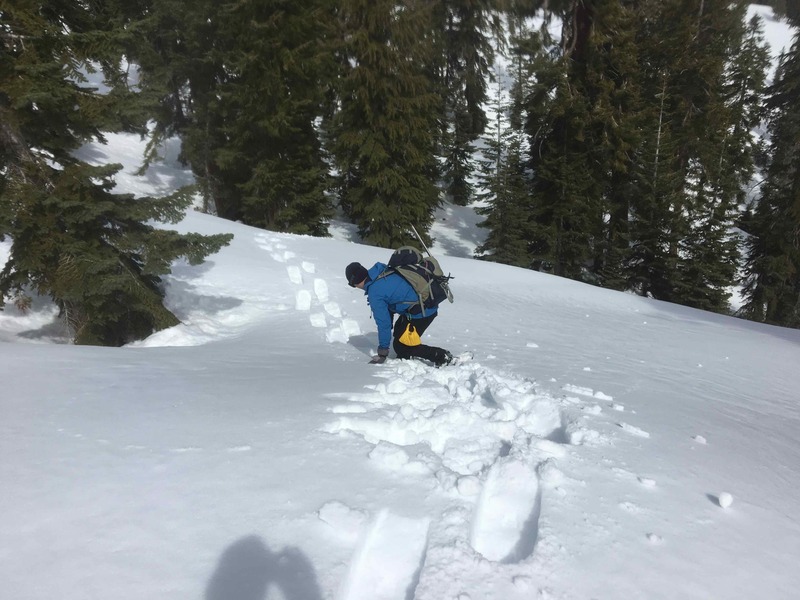 Soft, dry snow is difficult to travel across as your feet tend to sink into the snow forcing you to do high leg lifts with each step in order to make any progress. Known as post-holing — creating with your legs the type of holes one might dig for installing fence posts — this type of travel is exhausting. Snowshoes help limit this effect by spreading your body weight over a larger surface area, reducing the depth your feet sink into the soft snow. The snow we encountered that day, the last of winter, was quite soft. With the snowshoes on, my feet would sink approximately 4”-6” into the snow. Without the snowshoes on, my feet would sink up to my hips! The terrain we encountered was also quite steep. Believing we had stumbled upon the foot of Elephant’s Back, we tried to keep to the North and East of it, traversing along a steep slope attempting to not give up the elevation we had already gained climbing the difficult snow. Having given up the relative “safety” of the trail, my mind began to wander. Are we heading the right direction? What if we can’t find our way back? What if there is an avalanche? This type of negative thinking is never useful on a hike, but with my heart racing — I had thoroughly underestimated the difficulty of snowshoeing — and Brice making much faster progress than I through the thick, powdery snow — he was clearly in far better shape than I — my mind progressed further down that line. I imagined us stranded at night, cold, struggling through blizzard conditions (there was no snow in the forecast and the day’s high was going to be in the upper 40s!). Brice was obviously going to make it further than I would. I would collapse, frozen into the growing piles of snow and I would have to exhort him to leave me and make his own way back to civilization, safety, and his loving family. “Let’s climb this thing and figure out where the heck we are,” Brice called out from up ahead, abruptly waking me from my ridiculous daydream. He pointed at the massive wall of stone and snow directly to our left that we had been traversing around for the last hour. It seemed that we might be able to get above the tree line if we climbed a couple hundred feet. With a clear view of the surrounding peaks, we might also be able to use our topographical map to estimate our location. I followed Brice up, still extremely impressed at his level of physical fitness versus my own. I also managed to take in some of the spectacular winter views provided by our vertical ascent. As we reached a clearing of snow our target, Round Top, came into clear view, but something was wrong. Thinking we had been traveling towardsthe mountain, we had, in fact, been traveling perpendicular to our desired course taking us on a 2 mile loop around Black Butte, the peak on which we were currently standing on the Northwest face. We were almost 3 miles off course, and had almost half that distance to cover to get back on what we thought was the trail. As we were about to head off toward the mountain, a clear view of what we needed to do, we heard loud cursing and arguing as a group of people came into view about 100 feet below us on the same hillside. Apparently, the team of campers we ran into earlier that morning had followed our tracks off the trail and taken the same circuitous route around Black Butte that we had. We shared our thoughts on our location with them. The blaming started almost immediately with each of the youngsters blaming the other for going the wrong way. The campers eventually decided to sit down and eat lunch while we decided to continue our trek toward Round Top thinking it would be possible to reach the base of the mountain before our agreed upon 1:00PM turn-around time. Another hour and a half of traversing steep hills, trying not to give up the elevation we so challengingly gained, brought us just a mile and a half closer to our goal. Still struggling to understand our map, we couldn’t agree on a good course of action. I wanted to head down the hill to try and connect with where I thought the trail should be. Brice wanted to continue the direction we were heading and reconnect at the lake at the base of the mountain. Increasing difficulty in progressing forward and warming wet snow under our feet made the decision to go downhill easier for both of us and we decided to call off our adventure 15 minutes early to start heading back to the car, expecting a similarly difficult trek back. The base of the hill turned out to be the south end of Woods Lake. The north end of the lake brought us back to the blue diamond marked trail, further confusing our understanding of the area. We followed the trail back up to the car, getting there in about 2 hours of uphill hiking. Confused and tired we made the drive back home. Despite our misadventure we both enjoyed being outdoors all day, getting exercise and seeing new sights, but I was ready to be on my way back. I spent the next morning trying to understand what we did wrong and how we got so far off trail. I based my hiking trail expectations on the summer trails that are present in the Carson Pass Management Area. During the winter, these trails are covered by deep snow and replaced by unmarked wilderness trails and marked cross country skiing trails. The trail we followed (marked by blue diamonds) turned out to be the Wilderness Boundary trail. Had we followed that just 15 minutes further to Woods Lake we would have been able to identify the ski tracks going toward Round Top and may have had a better shot of reaching our goal for the day. Instead, we depended upon my poor research and insufficient map which caused us to make several bad decisions that compounded our difficulties. The whole trip, though enjoyable in a self-punishing sort of way, proved to be a failure, but also proved to be a learning experience. It’s very important to understand the destination. There is a wealth of information available online, but it’s important to be able to filter the good information from the less good information. If I had not stopped researching after discovering a map of the area that seemed sufficient, I might have discovered the winter trail map and had a better shot of achieving our goal. It’s also important to have a quality topographical map of the area. The map we had was not of sufficient resolution to make good decisions about topographical features and left us (incorrectly) guessing our location in several instances. Had we been on a multiple-day trek we might have become severely lost. Round Top still remains unconquered for me, but at least I will know better on my return.